President Vladimir Putin is increasingly trying to intimidate ordinary Russians into abandoning protests against him to keep his grip on power, jailed former oil tycoon Mikhail Khodorkovsky said. In replies to written questions dictated to lawyers during prison visits, Khodorkovsky, once Russia's richest man, accused Putin of resorting to political repression to try to reassert his authority after 14 months of protests. He said that such efforts were destined to fail and that Putin was pushing Russia into an era of economic and political stagnation comparable to the rule of Soviet leader Leonid Brezhnev. "Opposition to the current regime is growing and will continue to grow." Khodorkovsky said. "The risks for the regime are constantly increasing." Khodorkovsky was convicted of tax evasion, fraud and money laundering. He has always denied the charges, which he says were politically motivated. "A certain 'tightening of the screws' is undoubtedly going on," he said. "We see an expansion of old repressive practices, the creation of new ones and the preparation of a legal basis in case there is a need to sharply curb civil rights and freedoms." What was new in Putin's third term as president, he said, was the tactic of trying to scare people into not protesting. "There is a clear widening of repressions against protesters who are not the most well-known opposition figures. Most likely, the authorities want to scare common citizens, deter them from taking part in protests," he said. Khodorkovsky, 49, has for years been one of the sharpest critics of Putin, who last year faced the biggest protests since he first rose to power in 2000. The rallies have lost steam since Putin won a third term as president last March, but his approval ratings have sunk. The Kremlin denies clamping down on Putin's critics and has dismissed Khodorkovsky's criticisms in the past. But Western governments and human rights groups share some of his concerns. Several opposition leaders face criminal charges over their business activities, for allegedly plotting mass riots or for crimes they deny committing. Since Putin's new term began in May, parliament has also passed a series of laws that are widely seen by critics as intended to stifle dissent. 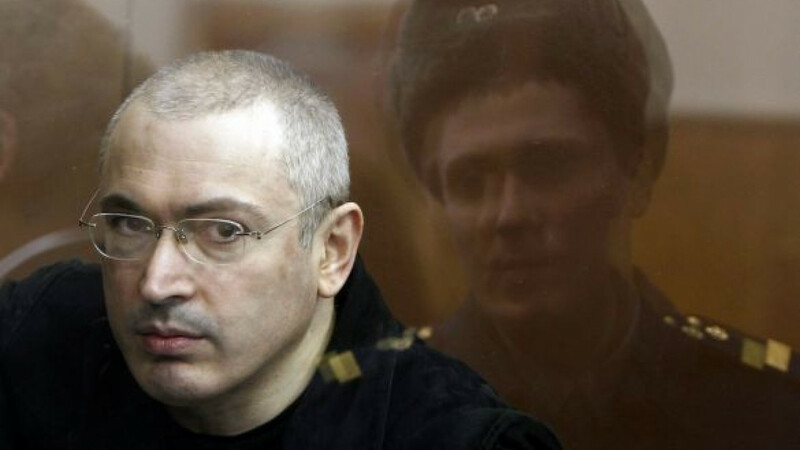 Khodorkovsky is serving his sentence in the Karelia region, near the Arctic Circle. He was arrested in 2003, during Putin's first presidency, and his oil firm, Yukos, was broken up and sold off, mainly into state hands. Khodorkovsky drew comparisons between life in Russia under Putin and the latter years of Brezhnev's 18-year rule, which lasted until 1982 and is often criticized for being politically repressive and devoid of meaningful economic reforms. "In some ways, Russia's current political regime resembles the Brezhnev regime in terms of pressure on the opposition," he said. "The reasons [for protests] are obvious: The effectiveness of this form of governance is constantly falling, and the costs of it is becoming more and more evident to society." "Corruption, the slow pace and poor quality of economic growth, the restricted social mobility for young people, simple tiredness with the same old face in charge, all this is causing clear irritation," Khodorkovsky said. He did not directly address a court's decision in December to reduce his 13-year sentence by two years because the questions had been submitted before the ruling. He could be freed in 18 months, but he and his lawyers say they are taking nothing for granted because hopes of an early release have been dashed several times. Khodorkovsky said he was part of the opposition, but he also said no group had a program that fully reflected his views. He said opposition activists facing charges should choose between admitting guilt, in the hope of more lenient sentencing, and trying to prove their innocence in Russian courts, which are often criticized for political servility. But fighting one's case was "a natural and inevitable stage of the protest," he said.